Dubai Customs launched a smart mobile app enabling passengers arriving in Dubai to securely submit Customs declarations electronically, thus bypassing the current traditional paper forms. The online application, called iDeclare, simplifies the Customs clearance process for passengers by enabling self-declaration of their must-declare commercial goods, personal effects or cash either pre or post arrival at the airport, saving them both time and effort. 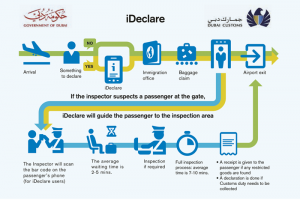 With the launch of iDeclare, Dubai Customs becomes the first Customs administration in the Middle East to implement smart mobile declarations for passengers. Through this smart app, the administration aims to further streamline passenger traffic into Dubai International Airport, which received 88.2 million passengers in 2017, topping all airports worldwide for the 4th year in a row. Clearance waiting time will be reduced by more than 60% from 45 minutes to only 5 minutes. Inspectors just have to scan the “bar code” generated by the app on the passenger’s smartphone. Moreover, iDeclare enables travellers to be better informed of the regulations applying to goods, and Customs inspectors no longer have to waste time filling in declarations on behalf of passengers. Dubai Customs’ latest tech innovation is designed to enhance the passenger experience and increase customer satisfaction, whilst optimizing border control. These measures will enable better protection of the economy and enhance security. The new initiative by Dubai Customs further reinforces the administration’s progressive adoption of digital transformation and technology-enabled automation of Customs processes and procedures. A smart solution for the smooth and efficient movement of air passengers, iDeclare is geared to make Dubai way ahead in terms of its readiness to host Expo 2020 (www.expo2020dubai.com), which takes place in two years.